Hey readers! I found one of the most coolest things while surfing facebook! 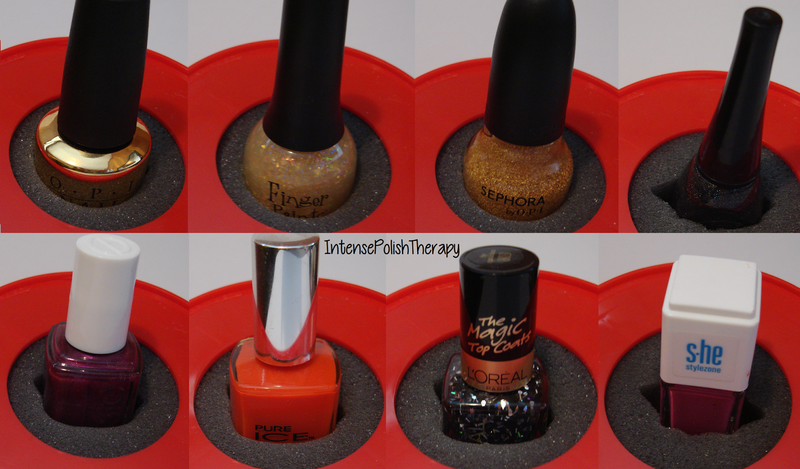 It's "The Lady Bug" It's a new take on the nail polish holder. Now you're probably thinking "Yeah, so what? I've bought one from Ebay before & it sucked!" & All I can say to you is just wait till you see this! It is one of the best ones I've ever seen! & Now that I've seen it & used it, I'm so thankful that someone, somewhere made this. THANK YOU SO SO MUCH! So now that I've told you all & have gotten your hopes up, let's get on with the post. So this is what the wonderful creation looks like in its packaging. & This is what it looks like out of the packaging. Sadly I was too impatient to wait & I took a picture right away instead of letting the sponginess return to its original shape. However I can assure you it's a diamond shape. & That's one of the best parts of this creation, is that the sponge will hold almost all of your bottles super snug. Here is me showing you just some of the different bottle shapes it'll hold. I didn't want to take pictures of every single bottle shape I own in it because then that might be a bit overwhelming however I can reassure you it fits about 95% of polish bottles. & The only ones it will not hold perfectly are my Brazilian Hits, Ludurana & Impala. So very slender small bottles it can't hold snug. Also Deborah Lippmann polishes don't fit either. Now I know most of you have probably purchased this one or a similar one online, with the hopes that it would work perfectly. When in reality you receive it & it works terribly. When theres a nail polish in it, it loses its shape, which makes the base a weird shape & it just doesn't cut it one bit. So for your own good just toss that terrible thing out & get The Lady Bug! I love this thing. It's the best nail polish holder I have ever used. I've used a few of them & none have compared to how well this one works & looks. This one isn't just a plain nail polish holder it's also cute. & No one wants a plain looking nail polish holder. They're just boring & not fun. This one even has an awesome name that goes perfectly with its look! I've always wanted to try the ladybug!